The Caillou Rosat (Rosy pebble) existed in France before the Conquest, and was a popular variety. It may have been so named for its size and shape or for the grit which it contained! At some time, soon after the Norman Conquest, it was introduced to England. In an England whose ruling classes spoke first French and then eventually a form of English, the spelling and the pronunciation gradually changed, as you will see below. in 1262, a writ of Henry III directed his gardener to plant six 'Cailhou' pear trees at Westminster and the same variety in the gardens of the Tower. (Close Rolls of the Reign of Henry III) This was the same as the 'Cailloels' recorded earlier, so they must have been well liked by the royal family! Arms of the Company of Glaziers Back in about the Sixteenth Century, members of the Kellaway/Callaway family bore arms. Kellaways were associated with glass-making, probably about the time of the re-building of Sherborne Abbey. 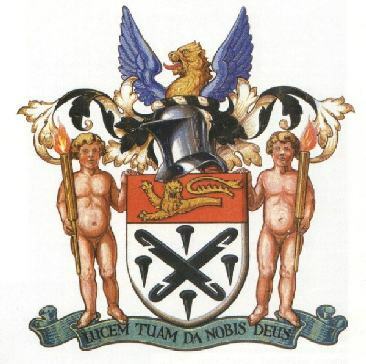 The family coat of arms bore a strong resemblance to that of the Worshipful Company of Glaziers and Painters of Glass, arms still visible at their London headquarters today. 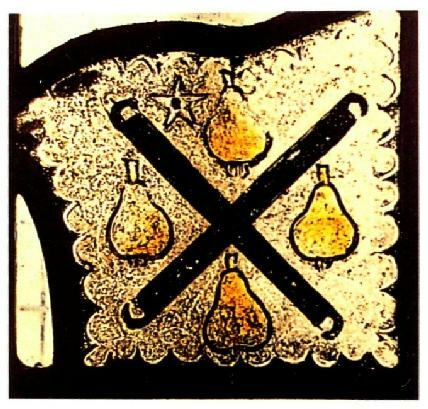 The Arms contain glaziers’ nippers, or grozing irons, “in saltire” (crossed) and four pears “vert”. 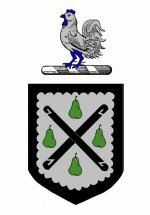 The description by the visitor from the College of Arms to Sir John Kellaway (or Callaway) of Hampshire refers specifically to “Kelway pears”. How did this happen? The most likely explanation is this. Heraldic symbols often made puns upon the name of the bearer of the arms. The first armigerous Callaway or Kellaway most probably, while copying from the glaziers’ arms, replaced the nails therein by pears with a name similar to his own. 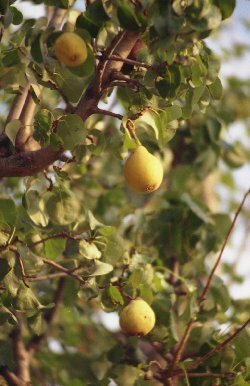 Kelway pears. These arms are recorded at the College of Arms. So what of the Caillouet clan in all this? The Kellaway/Callaway hypothesis, which has increasingly sound evidence, is that the name was introduced just after the Norman conquest, by a knight with a name like Caillouet. He may have come from the village near Evreux, which is pronounced Ky-oo-way. The spellings in England, especially in those non-literate and turbulent times, are various. The Caillouet and Cayouette clans in North America are descendants of Gilles of Brest. Gilles Caillouet's descendents, as well as those from the Brest region today, usually pronounce their name Ky-oo-ett. Nevertheless it has been the hope of K/C researchers to demonstrate a link, if it exists, between the Callaways and the Caillouets. Unfortunately, the evidence in France has probably disappeared as a result of the civil unrest at the time of the Revolution, and we may be unable to bridge the centuries between the Normans and Gilles. However there are two interesting facts. In his work on Quebec genealogy, published in 1914 , N-E Dionne (3) made specific allusion to the Normandy village. He also wrote that Caillouet is a “sorte de poire”. (p.101) Unfortunately, Dionne cited no sources. Dionne has been disparaged for the poor quality of his research. However, I must ask: where did he get that idea from? It cannot simply be a coincidence! Has the name been in hiding in French for 900 years? In 1611 the English lexicographer, Randle Cotgrave defined Caillouët as “the name of a very sweet peare”. (4) Cotgrave could conceivably have been Dionne’s source, even over a period of 300 years. And the pear seems to have become sweeter! All this proves nothing of course, but I like to think that it is a contribution to the discussion, and may lead to a breakthough in the future. (3) Narcisse-Euthrope Dionne. Les Canadiens-Français : Origine des familles émigrées de France, d’Espagne, de Suisse, etc, pour venir se fixer au Canada, depuis la fondation de Québec jusqu’à ces derniers temps et signification de leurs noms. Québec, Laflamme & Proulx, Imp., 1914..
(4) A Dictionarie of the French and English Tongues, compiled by Randle Cotgrave, reproduced from the first edition, London 1611, with introduction by William S. Woods, Associate Professor of French, Newcomb College, Tulane University, University of South Carolina Press, Columbia, 1950 . (which Philip Caillouet found in the Library of The University of Louisiana at Lafayette).